BackgroundWorker is a component that runs asynchronously as in the background. We need to create and use it along with Ajax to occupy async process. In the previous post, I already have an example of create a BackgroundWorker example using client script, ASP .Net Ajax BackgroundWorker Example Using Client Script & PageMethods. In this post, I use System.ComponentModel.BackgroundWorker class to run a background process. Its progress status will be showed in progress bar. That progress bar is located inside ModalPopupExtender Ajax Control Toolkit. So when backgroundWorker is running no UI activity allowed exept that inside the ModalPopupExtender. This example only do simple calculation. After calculation is completed the result shows on result div element. 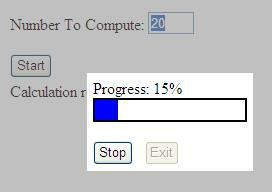 Its progress percentage showed as a progress bar. Starting an Ajax request is easy task. We can use ScriptManager, UpdatePanel and UpdateProgress controls but aborting it requires more client script. Common web example of abort/cancel ajax request has abort() method to XMLHttpRequest. On the other hand Asp .Net has its own way to accomplish this.